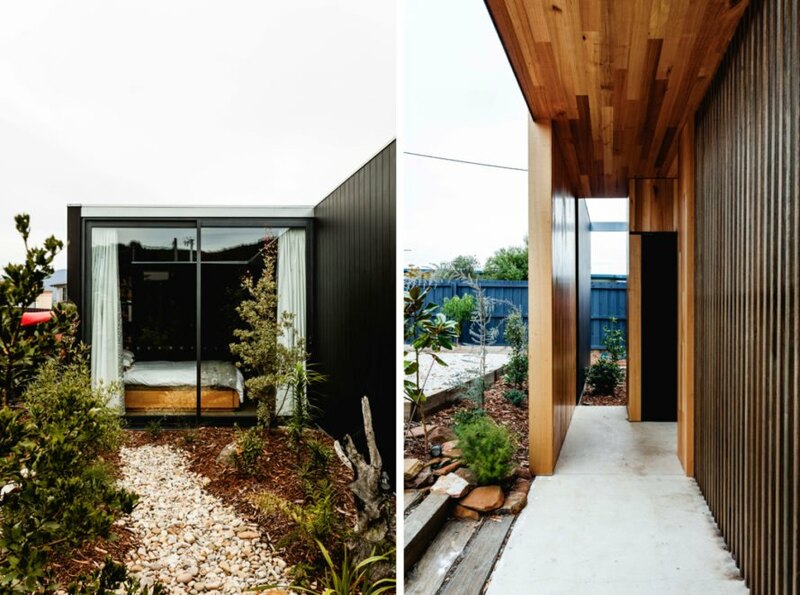 When asked by a long-time friend to build a garden-facing retirement home in Hobart, Australia, Brunswick-based architectural practice Archier created the Five Yards House, a timber-clad abode that takes its name from the numerous “yards,” or gardens, integrated into the design. To minimize onsite waste and to ensure rapid installation, the design firm turned to SIP (structural insulated panel) construction, a high-performing methodology that “provides structural, insulative and aesthetic solutions in one,” according the the architects. High performance and environmentally friendly materials were also specified for the rest of the design, from operable double glazing to recycled timber to LEDs. 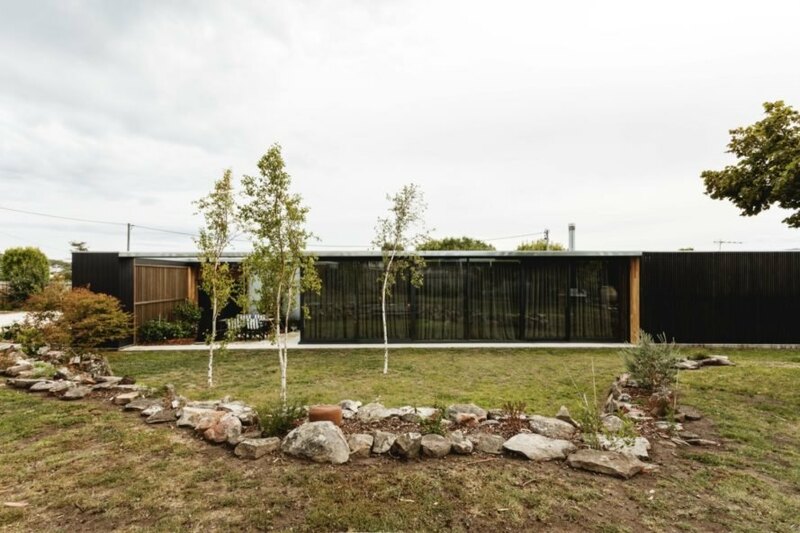 Strong connections with the garden were a priority in the 131-square-meter Five Yards House’s project brief. Rather than design a simple glass house for enjoying views of one garden, the architects designed the home around a series of unique gardens, each with its own distinct appearance and framed by full-height walls of double glazing. 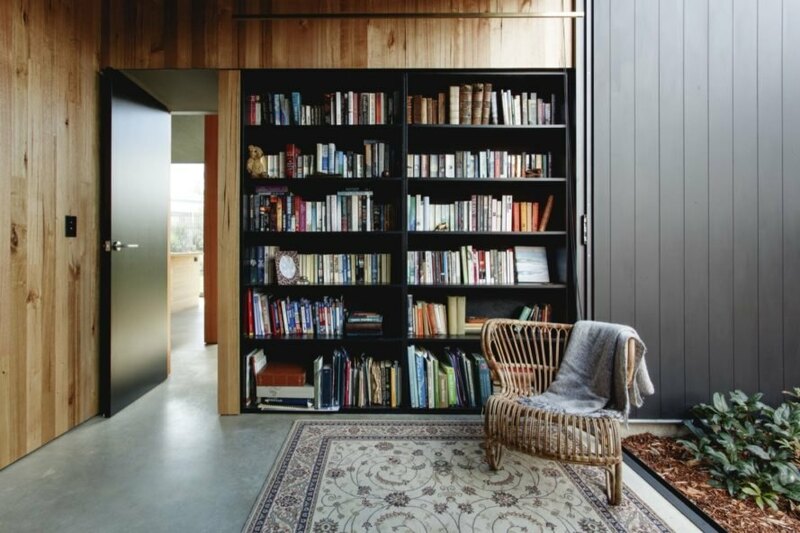 The entrance on the east side is flanked by two gardens, or “yards,” and opens up to a mud room, a library and a long hallway that extends to the far west end of the home. 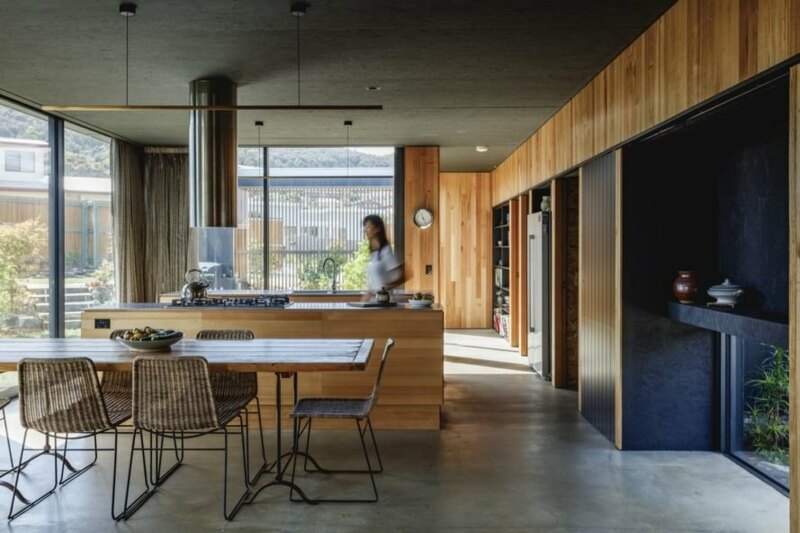 At the heart of the building is an open-plan living room, dining space and kitchen that connects to the outdoors on both ends; a smaller garden is to the south, and a more spacious yard is to the north. The bedroom is located at the far end of the house and overlooks a small garden as well. Because the house was constructed with SIPs, the building boasts high thermal performance, and the operable walls of glass allow for natural ventilation in summer to negate the need for mechanical cooling. A restrained palette of natural materials helps strengthen the indoor-outdoor connection. 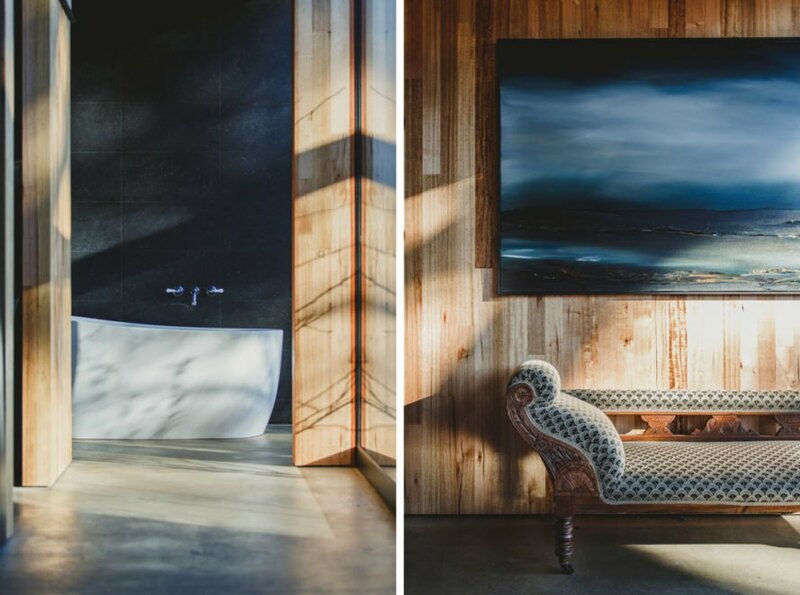 Recycled Tasmanian Oak timber was used to line the interior, and the exterior is painted matte black. 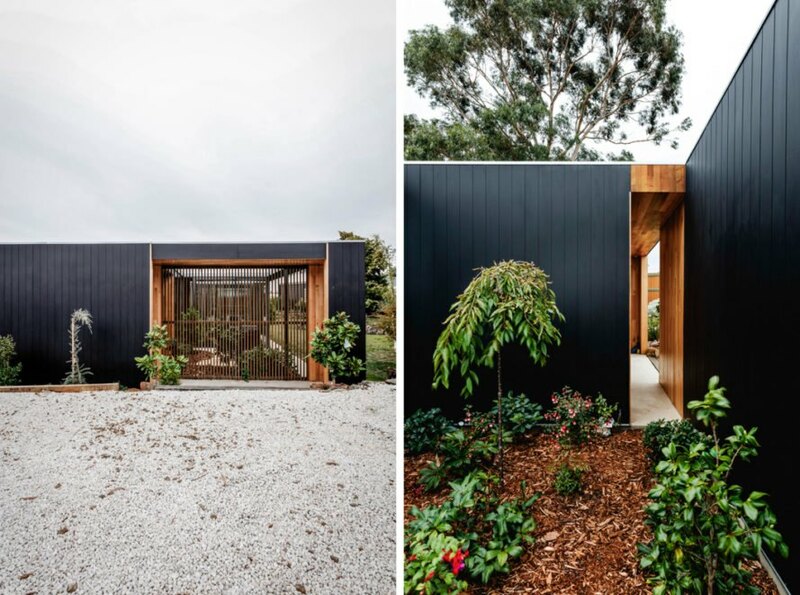 The architects of Archier have designed this retirement home for a long-time friend. The team used SIPs to minimize construction waste. The design incorporates five unique gardens that surround the home. The interior is lined with recycled timber. The home features high thermal performance. A neutral materials palette keeps the focus on the outdoors. A look at the floor plans of the Five Yards House. Each room of the house benefits from garden views.